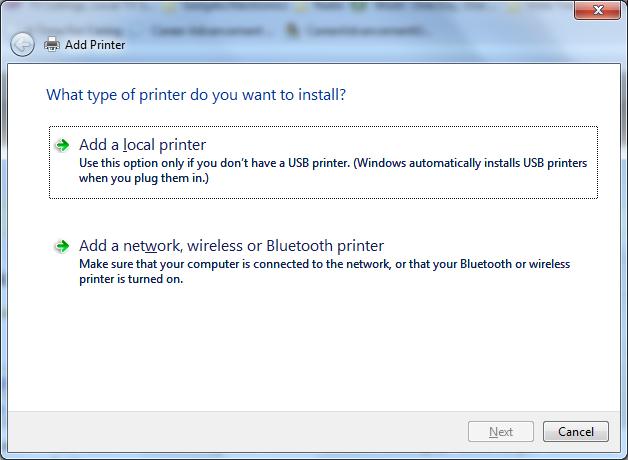 Having trouble printing to a network printer from Vista or Windows 7? 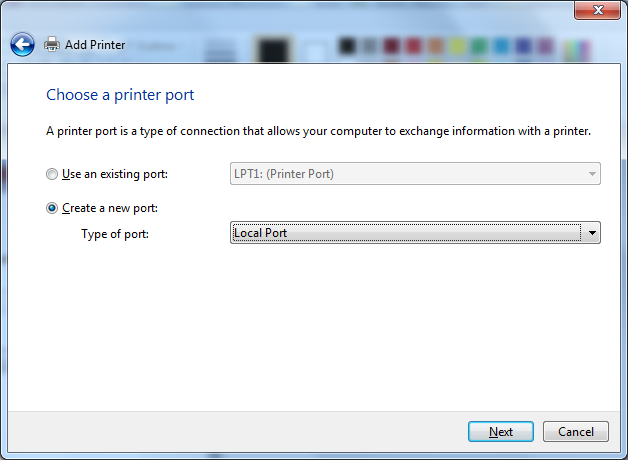 Uncheck the box marked :Automatically detect my PnP printer (Vista only). Select Create a New Port and leave the default in the drop down selection as Local Port. Windows displays a small dialogue box asking a port name. Key in: \\<computer_name>\<printer_name> See note below. 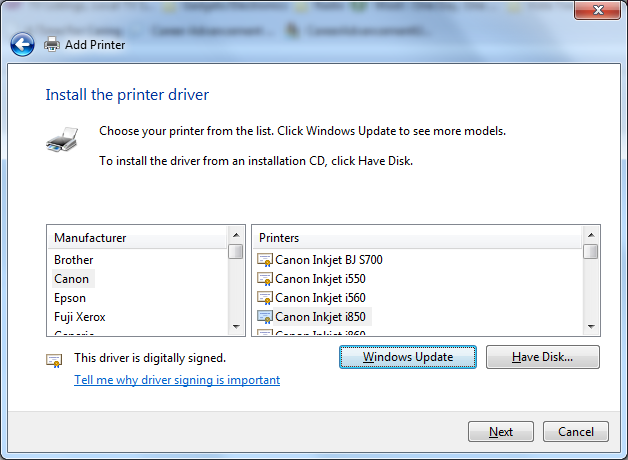 Windows will show a list of printer vendors and models. The list looks just like the Windows Add Hardware Dialog. Select your printer manufacturer and printer model from the list. If your specific printer isn’t shown, you can click on Have Disk and browse to the folder where you have the unpacked drivers for your printer. The above procedure worked like a champ for me. More recently I upgraded the laptop to Win7 64. I naively hoped that Microsoft had fixed this problem in Win7 but no such luck: I had the same issues I had with Vista. 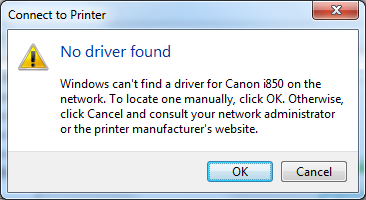 Fortunately, the above workaround also did the trick on Win7 and I’m now happily printing to my Canon i850 attached to an old XP machine. Do You Back Up Your PC Data? Backing up the data on your PC ranks right up there with getting a root canal. Or so you’d think based upon how few people have a good backup system in place for their irreplaceable data. Yet today, with so much of our lives in digital form, it’s more important than ever. This issue was brought sharply into focus for me on 15 October when I returned home from a meeting to find the screen of my eight week old laptop black with the ominous message: “No OS found”. 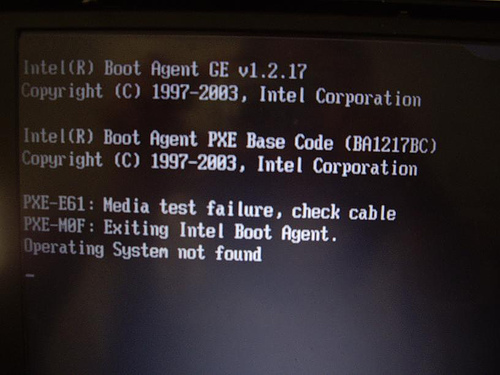 I tried numerous times to get it to boot but to no avail. Diagnostics confirmed that the hard disk had failed. I guess I shouldn’t have been as surprised as I was, as electronics typically will fail in the first 90 days or they’re good for years. But my heart fell when I saw that message. Why? Because I had not yet backed up any of the data on my “new” laptop – I figured I had time to do that later. Fortunately for me, I was able to start the laptop using a bootable Linux CD (from Knoppix). And, though the laptop’s HD would no longer boot, it spun up and I was able to copy all of my data off onto another network computer (“and there was much rejoicing”). I got lucky. This time. I should have had a backup system in place. I do on my other PCs but had not yet set something up on the laptop. Valuable life lesson learned. Backing up data is not unlike saving for retirement: both are most successful if automated. I use a simple system to do this: I have each PC on the network copy any new files to a different PC on the network every night using one of two free utilities: Abakt and Cobian Backup. It’s simple and automatic. Large media files I back up manually every so often to writeable CDs or DVDs. I do the same with any downloaded software I wish to back up. But what if you don’t have multiple computers or, even if you do, they are not networked together? As I see it you have two decent options: utilize an online/internet backup service (PC Mag has a review of several here) or a removable external drive. Several of the former services offer a free option with 5GB of storage; cost of the latter option has plummeted to where you can now pick up 640GB of external USB storage for about $70. Spending a little more will typically buy you a drive with included, automatic backup software. Trust me – automatic is good. One final backup option I’m partial to is a network attached storage (NAS) solution employing either RAID 1 or X-RAID® (to be fair, there are RAID solutions available for inside your PC but that gets much more complicated). These RAID configurations write your data to two physical hard drives which are mirror images of each other. When one of the drives fail (which it will do – drives are electromechanical devices with a lifespan of 3-5 years) you just replace the failed drive with a new one and the RAID software will mirror the data on the good drive onto the new one and you are back in business. To insure the safety of your data if you go this route, you must either save all of your critical info only on this drive array OR you must use one of the previously discussed back up software programs to copy key data to the RAID system on a daily/nightly basis. It has gotten so easy and inexpensive to automatically back up your data that there is no excuse to not have a system in place. Don’t wait until it is too late. It’s natural at this point to breathe a sigh of relief and want to take a day off. Maybe two. Don’t do it! 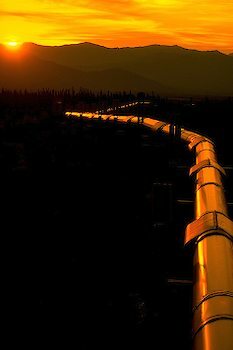 No matter how well the interview went, or how much you desire to work for that company, you should keep applying to other positions to keep your “pipeline” full. Why? That plum opportunity may not turn into an offer. Or it may not turn into an acceptable offer. If you let your pipeline go dry while you wait, and bad news comes, you could set your job search back by weeks. Not good, right? If you keep it full, the worst case is that you’ll receive multiple job offers. Oh wait – isn’t that the best case? And before you write in saying “No one gets multiple job offers in this economy,” let me tell you that is precisely what happened to two friends of mine during their job searches this year. As of this writing I am awaiting news on the results of interviews with three different companies, the oldest dating back to the first half of September. What am I doing while I wait? I am continuing to network and apply to other companies. In fact, I have an interview with a fourth company this coming Tuesday. I’ve also attended the Career Navigator job search “boot camp” to brush up on my job search skills. And I’ve been giving presentations on social media and job search to keep my presentation skills up, blogging to keep my writing skills up… you get the idea. It’s easy to drop your guard during your job search when you have landed one or more interviews. 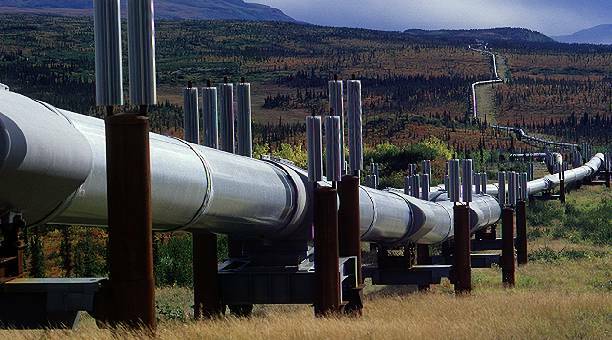 Don’t do it – keep your pipeline full. Have an Old Bike Cluttering Your Garage? Donate it here! 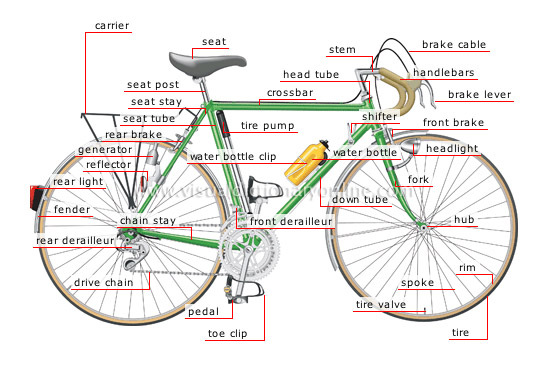 Do you have an old bicycle (or two) cluttering up your garage? Looking for a good way to get rid of it (them) that doesn’t involve a landfill (you DO want to be green, don’t you)? Each fall the Avon High School Tech Club (some of you may recall I blogged about the Tech Club before, regarding their wooden bridge competition entry) holds a bicycle drive for charity. This year it is on Saturday, 31 October (yep – Halloween), from 12:00 PM to 3:00 PM at the Avon High School parking lot (only about 35 minutes south of Rochester and a lovely opportunity to enjoy the fall foliage). 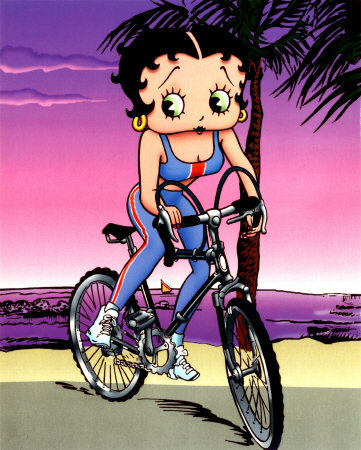 Adult-sized bikes, bike frames and parts are accepted in any condition. As a community service the Tech Club students rebuild/recondition the bikes to be fully functional. Bikes are then distributed through “Second Life Bikes” to Rochester area individuals with no other means of transportation. If you have a bike to donate it may be dropped off at the Avon High School parking lot on Saturday afternoon. Tech Club members will be there to accept your donation and thank you. If you are unable to drop off your bike on Saturday, pick up arrangements can be made. Please contact the Tech Club adviser, Mr. Bob Castle, at 226-2455 x1604 or at bastle@avoncsd.org. Thanks to Mr. Castle and the Tech Club members for supporting folks in need! According to one blog, some 35 to 39 million (12%-14%) Americans move to new homes each year. Of those, about 4.7 million people move to different states each year. Relocating to a different state can be an intimidating proposition, for dozens of reasons. Today I’ll review some of the financial implications and some handy tools available on the internet to help you make an informed decision. From a financial perspective, the two key things to think about are the differences in salary and cost of living between two areas. There are lots of salary data web sites that will provide data on what a particular job pays on average in a particular area. Note that there can be significant highs/lows either side of this average. 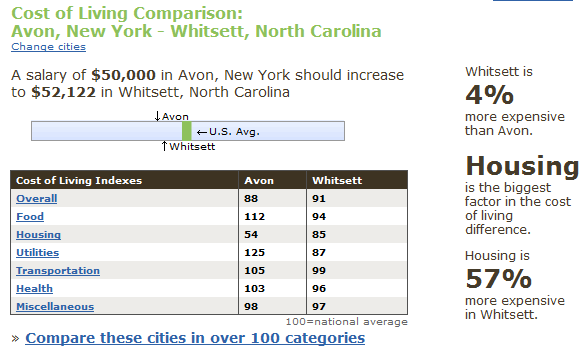 One great web site I have used to compare cost of living between two areas is Sperling’s BestPlaces. While providing a wealth of other information, this site let’s you compare the cost of living between where you live now and where you are considering moving to. Click on the “Cost of Living” tab and follow the prompts. This tool will tell you how much more (or less) expensive your destination city is, what the major driver is in the cost difference, and a table comparing a number of cost of living indexes between the two locations. Sperling’s also has data on schools, crime, and climate. Another useful web site is City-Data. This site aggregates demographic, weather, census, and other data in one easy to use interface. Type in a potential relocation spot and you can find out just about anything about it. While City-Data does not have the direct cost of living comparison option that Sperling’s does, they have reams of data and a terrific, user supported forums section where you can ask questions or read previous questions/answers about a particular city or town. I’ve found the forums to be invaluable. While salary and cost of living are key pieces of information to have when considering relocation, another critical factor for those with children is the quality of education available. If you need more education info than the two previously mentioned sites provide, I recommend that you check out Great Schools. 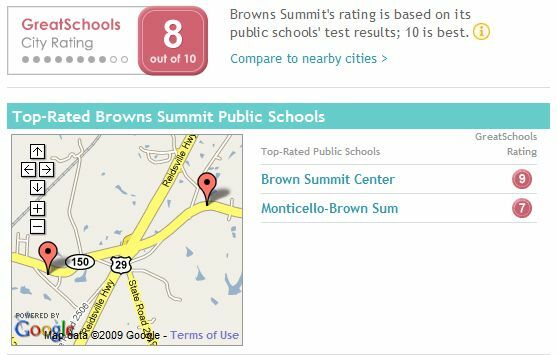 One nice feature of this site is that it will compare the schools in your target city with others in surrounding cities to help you figure out which one(s) is (are) best. Relocation might be stressful, but these tools will help you objectively evaluate your options and aid you in making the best choice for you and your family. I’ve never been big on self promotion. Funny how things change when you’re in job search. Not only have I learned to self promote now, but I’ve realized that I need to do so for the rest of my career (for some tips, read Brag! : The Art of Tooting Your Own Horn without Blowing It). This week I thought I’d talk about my experience being on the radio. 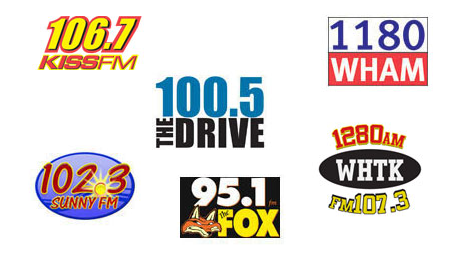 Seven of the local Clear Channel radio stations have been running a promotion during the last few months called “Radio Resume”. This is a free public service they initiated to help unemployed folks advertise their availability. I learned of this promotion a few weeks before it started and immediately applied. On 22 July I received a call from the WHAM general manager saying I’d been chosen and on 23 July they called to record my Radio Resume. What’s a Radio Resume? It’s a 30 second spot (5 second intro & 25 second pitch). About 3-4 sentences. It closes with a request to see your resume on the station’s web site, where all of the Radio Resume participants’ resumes (past and present) are hosted. Last I checked the promotion was still going on so, if you are unemployed and live in the Rochester area, I recommend you consider applying. The application process is simple – just enter why you feel you should be chosen – in 300 characters or less. For those of you on Twitter or LinkedIn, that’s just over two tweets or status updates. Marital status, number of children, etc. Write out what you want to say, bold the words you want to emphasize, and add hyphens anywhere you want to pause. Then practice, practice, practice. Time yourself. Whittle it down to a punchy delivery of the bare essentials. This is radio – your message is only as good as the delivery. Oh wait! Isn’t that true of all of your self-marketing materials? Is a Radio Resume worth the effort? Absolutely! Worst case, people in your network will hear it and you will be top of mind with minimal effort on your part. If they hear of a position that fits you they will remember (and think of) you. Best case, it can lead to an interview and, possibly, employment. I know of two people, including myself, that received interviews as a direct result of someone hearing their Radio Resume. So stop sitting around reading blogs and go apply for a Radio Resume. And best of luck! When my position was eliminated in February I Googled myself, because outplacement firms and career counselors all say that you want to know what references are on the web about yourself. Fair enough. There are two reasons for this (and, no, narcissism is not one of them): one, you want to be sure there is no negative or erroneous information posted about yourself and, two, you want to be “findable” (via positive references). I was dismayed when I had to wade though the first six to eight pages of Google results before finding any reference to myself. I think that singular reference was to my LinkedIn profile, as that was about my only web presence at the time. I also made it a point to cross reference all of my sites to each other using links. How did it work out? Well, I just now Googled “Chris Bigelow” and found my blog (fifth and sixth entries) and Google profile (“eleventh” entry/footer) on the first page of the search results. On the second page I found my Twitter account (second entry) and a directory of all “Chris Bigelows” on LinkedIn (fifth entry) where, incidentally, I show up as the second directory entry. That’s five times in the first two pages of results. Much better than my previous showing. “Fine,” you say. “So where is this all going?” Over the course of my job search I have been contacted by numerous recruiters (both internal and external). They have found me in a variety of ways on line: LinkedIn, Monster, Lynxster and CareerBuilder. Last week, though, I experienced a first when I was contacted by a corporate recruiter who found me via Google. And not by searching for “Chris Bigelow”, which was my original expectation behind increasing my web presence. This recruiter found me by submitting a Boolean search string of attributes desired for a specific open position at that company. I have to admit that it had never occurred to me that I could be found that way. Needless to say I was pleasantly surprised. Later that evening, as a test, I entered the Boolean search string “engineer AND lean AND ‘powder coat’” into Google and didn’t I show up as the second and sixth entries on the first page of results. Wow! Powerful stuff. The next day I was discussing this incident with a friend who is an independent recruiter and he said that the best, cutting-edge recruiters are now employing this technique. In the fourteen years I spent at my last employer, the internet went from nascency to ubiquity and job search has changed dramatically because of it. Addendum, 28 August: This post has received a lot of comments, mostly on the LinkedIn groups where I posted a link to it. While the feedback has been generally positive, I have had some cautionary feedback as well which I want to share. As is true anywhere on the internet, you need to exercise caution when sharing personal information. Since this runs counter to the whole concept of social media it creates an extremely delicate balancing act. Making too much information public places you at an increased risk of ID theft, common burglary, and more; making too little information available reduces a potential employer’s ability to find you. 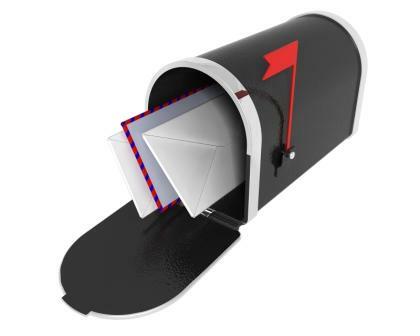 While the choice of how much information to share is strictly a personal one, I recommend that you do not share your home address or phone number. You might take this a step further and list your location as simply the nearest metro area. At the risk of stating the obvious, certainly don’t share your date of birth or social security number. And by all means, don’t broadcast travel plans (“Hello – Mr. Burglar? We’ll be in Cancun the week of January 7th…”). Best of luck raising your visibility, but remember to be safe. My name is Chris Bigelow and I am a Senior Industrial / Manufacturing Engineer with an MSIE and a BS in Engineering & Management. I don't design products - - I develop & implement methods to manufacture them quickly, inexpensively, and with high quality. I strongly impact the bottom line by successfully identifying opportunities to reduce manufacturing cost, cycle time and defects and implementing changes to realize those savings.